One of my favorite lunches is the lentil soup and chicken shawarma sandwich at Continental Cuisine in Fairlawn. The modest place is half pizza shop and half Lebanese sit-down restaurant. The pizza reportedly is good, but I am enamored of the Mid-Eastern and Greek food served in the comfortable, quiet dining room. I keep meaning to try the kibbee, tiropita (cheese and phyllo pie) and baba ghanouj, but every time I visit, the lentil soup and shawarma lasso me. I’m hooked. Even though I know I can eat only one or the other, I usually order both, eat the soup, and end up taking the sandwich home. 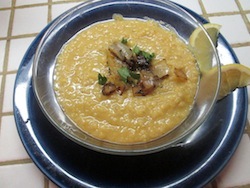 The red-lentil soup is thick and porridge-like, deeply flavored, and with a faint note of spice. The shawarma consists of marinated, grilled chicken pieces slathered with a powerful garlic sauce and rolled in a pita with dill pickle and cubes of tomato. The tight pita roll is then crisped up in the oven. Last week, in one of my foolish “how hard can it be?” moods I decided to make the soup and sandwich myself. Hey, I could have this meal anytime!! Without leaving home!! First I researched the recipes, then hit the store for pickle slices, lemons, lots of garlic and pita. Then I had to figure out how to modify the recipes I had found so they tasted like my favorites from Continental Cuisine. At about 8 p.m. I had lunch. Anyway, if you marinate the chicken overnight and make the sauce in advance, you can knock out this meal in less than an hour. The soup, in fact, is ridiculously easy to make – just simmer a pound of lentils in chicken broth and stir in some cumin and cayenne. I was amazed at the rich flavor considering the paltry list of ingredients. It was so good I found myself eating the cold leftovers for breakfast. I was surprised to find in my research that the shawarma eaten all over the Middle East is considerably different from the sandwich served at Continental Cuisine. Traditionally, thin slices of marinated chicken or beef are jammed together on a big upright skewer and rotisserie cooked, ala gyro meat. The shaved meat is served in soft pita bread with chopped tomatoes, garlic sauce (or sesame sauce if using beef), chopped tomatoes, parsley and perhaps cucumber. The vegetables vary. The sandwich I like is filled with little nuggets of grilled chicken, dill pickle instead of cucumber, and has a crisp rather than soft wrapper. To me, the dill pickle slices are a brilliant addition. The puckery note, juxtaposed against the rich garlic sauce, practically makes the sandwich. Also, I’m obsessed with the thin, crackly baked pita wrapping of Continental’s version, so I rolled and baked mine, too. My garlic sauce tasted very much like the restaurant’s, even though I cheated by stirring in mayonnaise at the end to repair my broken sauce and prevent it from separating during storage. The extra garlic sauce will keep for a long time in a lidded jar in the fridge, and would taste great on grilled meats and all kinds of sandwiches. It’s powerful, though, so go easy until you decide how much garlic you can take. Rinse and dry chicken. Slice across the grain into ¼-inch thick ribbons. Place in a large zipper-lock plastic bag with the lemon juice, vinegar, garlic, olive oil, salt, paprika, ginger and nutmeg. Seal. Knead the bag to mix and distribute the marinade. Refrigerate at least 4 hours or preferably overnight, turning bag occasionally. Heat a large skillet or griddle over high heat. Gloss with oil. In batches if necessary, cook chicken strips quickly on both sides until they begin to brown. Set Transfer to a plate and set aside. Cut around the edges of each pita loaf and gently separate without tearing. If bread is prone to tearing, heat for 10 seconds or so in a microwave. On a counter, line up the meat, mayonnaise mixture and dill pickles. Heat oven to 350 degrees. One at a time, microwave each pita half on high powder for about 10 seconds, until until bread is soft. Quickly spread some garlic sauce over the cut side of the pita, place some chicken in a line down the center of the pita, and top with one or two pickle chips. Roll pita around chicken cigar-fashion and place seam-side down on an ungreased baking sheet. Continue until all chicken is used up. Bake at 250 degrees until pita is crisp, about 15 minutes. Makes 2 to 3 servings. Separate and peel the garlic cloves. Remove the greenish center germ if present. Puree garlic with salt in a food processor, scraping down sides several times until mixture forms a paste. With the motor running, drizzle in about ¼ cup of the oil. Continue processing until the oil has been absorbed. With motor still running, drizzle in 1 tablespoon lemon juice. Repeat until all oil and lemon juice have been used. The mixture should be thick and creamy. If it breaks, as mine did, stir in the mayonnaise by hand and chill. Wash lentils, discarding any debris. Place in a large saucepan with the broth and bring to a boil. Remove any scum and simmer for 30 minutes, until the lentils disintegrate. Add salt, pepper, cumin and cayenne when the lentils begin to soften. Add water if necessary to thin the soup to a light, creamy consistency. To make the garnish, fry the onion in oil in a skillet over medium-high heat until the onion is very brown, almost caramelized. Watch carefully and stir often. Add garlic and coriander and fry until the aroma rises. Garnish each serving of soup with some of the onion mixture and parsley and accompany with lemon wedges. Makes 6 or more servings. I’m reading a book that I wondered if you’ve read. It’s called “Cakewalk,” a memoir by Kate Moses. It’s an interesting book with a lot of classic baking recipes throughout (after each chapter). I haven’t tried any yet (gave up desserts for Lent), but they are sure tempting! Dear Cheryl: I’m so glad you brought up the subject of good food reads. I’m a ferocious reader and I love a good food-centered book, whether memoir or fiction. I’ll put “Cakewalk” on my reading list along with a memoir my friend, Susan, recommended last week, “Lunch in Paris: A Love Story, With Recipes” by Elizabeth Bard. I just finished “The Particular Sadness of Lemon Cake” by Aimee Bender, a lyrical novel with a quirky premise: The main character can taste the mood of the cook (and the provenance of the ingredients) in whatever she eats. After becoming weary of food mysteries a few years ago, I’ve been on a food memoir kick. In the last couple of years I’ve read and loved a number of them, including “Blood, Bones and Butter” by Gabrielle Hamilton, “The Sweet Life in Paris” by David Lebovitz and “Born Round” by Frank Bruni. Less successful but still worth reading was “Apron Anxiety” by Alyssa Shelasky, the former girlfriend of Master Chef hottie Spike. Books on my wish list are “Yes, Chef” by Marcus Samuelsson,” “Life, On the Line” by Grant Aschatz and “Fresh Off the Boat” by Eddie Huang. While looking up spellings and complete titles of some of the books I’ve mentioned, I found another memoir I must read immediately: “Puglia: A Culinary Memoir” by Maria Pignatelli Ferrante, translated by Natalie Danford. I’m crazy about Italy (after visiting three times), and my dream is to spend a couple of months there soaking up the culture, inhaling the food and learning the language. I would love to hear other food-book recommendations. In fact, I’d love to start printing one-paragraph reviews of food books – cookbooks, memoirs or novels –from readers in my newsletter. Bring ‘em on! After searching many sites, my best guess on achieving a sauce close to the original Escoffier Diable Sauce would be mixing Heinz 57 sauce with Dijon mustard. You might have to play with the amounts a bit to make it work. Dear Judy: I think you’re right. Although I’ve never tasted the sauce, that’s what it sounds like to me, too. Check out one more suggestion, below. From Ellen Otto: Re: the Akron City Club Seafood Sauce … I, too, had spoken with Russ Vernon at West Point Market about finding it (the Diable Sauce) and he told me as well that it is no longer made. I make the sauce and just omit the Diable Sauce. It is still pretty good, but I think using some anchovies could be great. I’m going to try that. Dear Ellen: Thanks for the idea.